It was fifty years ago – the 16th and final #1 song of 1968 was I Heard It Through The Grapevine by Marvin Gaye. I Heard It Through The Grapevine took over the #1 spot from another Motown act- The Supreme’s and their Love Child on December 14, 1968 and would maintain that position for seven weeks until February 1, 1969 when Crimson And Clover- by Tommy James and The Shandell’s replaced it. I Heard It Though The Grapevine was written by Norman Whitfield and Barrett Strong. Gaye recorded it first in early 1967 but blocked the release in an argument over how he sang the song. In the meantime Gladys Knight and The Pips recorded and released the song as a single and it went to #2 on the pop charts. 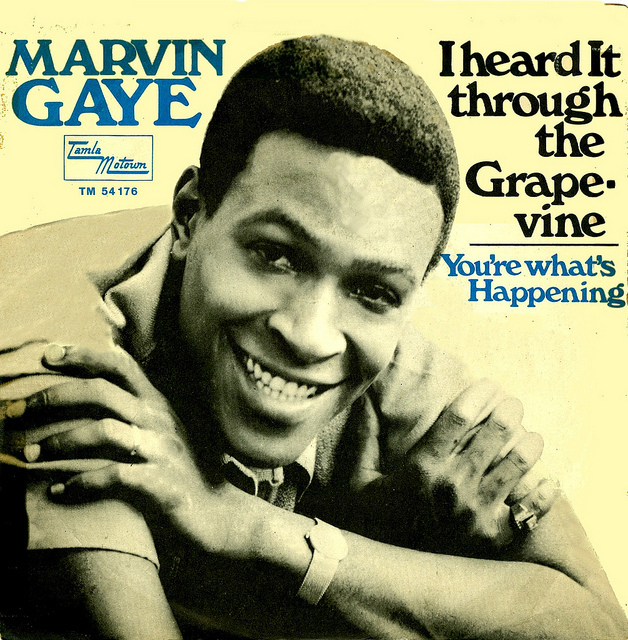 In 1968 Norman Whitfield wanted Marvin’s version of Grapevine released as a single but Motown head Berry Gordy was against it because well- Gladys and The Pips already had a big hit with it. It was tacked on to Marvin’s next album- DJ’s began playing it and it was released as a single- and well the rest is history it became one of the greatest pop songs ever. In Dave Marsh’s book “The Heart Of Rock N Soul”- where he ranks in his opinion the 1001 Greatest Singles- he ranks Marvin’s I Heard It Through The Grapevine- as the greatest single ever. Of course that can be debated- and there is no right answer as Marsh admitted but it is a terrific song as sung by Marvin Gaye. The Gladys Knight and the Pips single to me is pretty lame in comparison. I Heard It Though The Grapevine would also became at the time the best selling Motown single. A couple of years later in 1970 Creedence Clearwater Revival recorded an 11 minute version of Grapevine on their Cosmos Factory album- released as a single it reached #43 on the pop chart. I like the Marvin Gaye version as well. Creedence’s version is driving but it’s too long to me anyway. I agree Marvin’s version is THE version. I love Marvin Gaye’s version the best, but I also love Gladys Knight & the Pip’s version, and I’ve always loved her voice. I wonder how I would have felt about Gladys Knight and The Pips version if I had heard it first back then as they were released? After Marvin’s version I never cared for her’s but that is just one song- she was a fine singer.